This Facebook group already has over 2,000 members. Come join us! It’s hard to believe it’s been over six years since I started our blog, Facebook, Instagram, YouTube, and Twitter accounts. It’s been such an encouragement to me seeing so many of your emails, comments, Facebook messages, etc. This community is so supportive of me and so kind to our family, thank you for sticking with us as we have shared our story. As of today, our Facebook page has over 250,000 “likes.” As great as that is, it’s hard to build an online community through that page. I share posts, and so many of you comment back…but you aren’t able to really ask questions to other parents, get encouragement from others, or share your story with others. To put it another way, you “get” to hear from me, but you don’t get to connect with other parents. 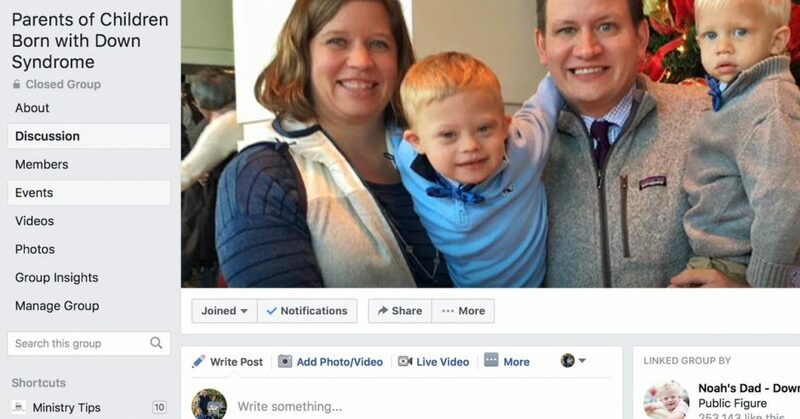 Last week I created the “Parents of Children Born with Down Syndrome” Facebook group, and it already has 2,000 members! The group hasn’t even been active for a week, and I’m already so encouraged by the online community that is forming. If you’re a parent of a child of Down syndrome, I encourage you to click here to become a member of that group and be a part of this special place we are creating. 5 Reasons a Facebook Group for Parents of Children with Down Syndrome is Awesome! 2. Parents can ask questions and get help from other parents. 3. You get to “meet” people with Down syndrome that live in other parts of the world, like Bo from the Netherlands! 4. You get to connect with people with inspiring stories, like this mom who adopted two girls with Down syndrome! 5. You know you aren’t alone! Seriously, my Facebook feed has been filling up with pictures of people sharing pictures of their family. You realize there are people with Down syndrome all over the globe, and it’s awesome! If you think you’re alone on this journey, you aren’t! These are just a few of the reasons why you should join our Facebook group. If you’re a parent of a child with Down syndrome and haven’t joined the group yet, I hope you’ll join, and share your story. There is a community of parents waiting to meet you! By the way, I’m hoping to be a part of creating the largest online community of parents of children born with Down syndrome. Will you please click the share button below to share this post and help me spread the word! Also, if you know of any other parents of children with Down syndrome, please invite them to the group. Thank you, it’s an honor to be on this journey with you!